My quest to "use what we have" includes that neglected strip of back yard. I've turned to the library for research. 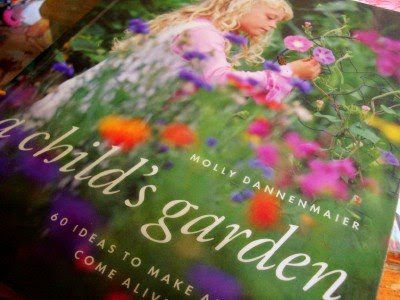 So far, my favorite is A Child's Garden by Molly Dannenmaier for its clear photos and design advice. Among other things, we're creating a place to hide, a place to dig, a place to splash, with things to cut and nurture. I've also been impressed with Sharon Lovejoy's Roots, Shoots, Buckets & Boots . She illustrates whimsical projects and theme gardens. The best part: both books recommend natural materials and creative reuse! I have the book Roots, Shoots, Buckets and Books! It is a great one! I'll have to check the other one out of my library. You'll have to share you garden in pictures when you've got it all completed! I'm glad to have found your blog. Hey! Melissa Wiley just posted Roots, Shoots on her blog today, too. I encourage you to get The Victory Garden Kids' Book. Someone gave it to my kids long ago. You might also check out your local Cooperative Extension service for some good free research-based information on gardening. In some states they even provide free soil testing so you are sure that you are planting what will grow in the soil you have or are then able to ammend it accordingly. Enjoy! Pole bean tee-pee! Pole bean tee-pee! Uh, did I mention a pole bean tee-pee? Tall sunflowers. Plants that attract butterflies. Okay sister, you're speaking my language here! I have been all over the Internet looking for different ways to design my garden this year to make it fun and ashtetically pleasing. Now Im going to have to go check this out! Looks like a wonderful book. I hope you will update us on the progress as y'all go along. that looks like a good one. i'll have to add it to my list. Looks like a lovely book. I love to get the kids involved in the garden. Love the cupcakes! I have roots, shoots, buckets, and boots. Fun book! We planted the pizza garden once. I need to pull it off the shelf for some fresh ideas. I have a strip of ground that I gave to my children. They are getting ready to plant some more veggies. They love having their own garden. I am just the technical adviser. Your garden ideas sound like lots of fun for the little ones! We planted a sunflower house for our kids last summer. Talk about a hit! All we did was plant Mammoth sunflowers in the shape of a square with a little space left out for a door. Then around that we planted shorter rust colored sunflowers. The kids loved it! They dragged their toys, books, snacks, etc. in there and would spend hours playing. Oh, I love Sharon Lovejoy's books. . .I hope you have fun planting and nurturing! libraries are great for free books! Love it! thank you for the book recs. i have requested both to be sent to my nearest library extension, so we can enjoy them too! hope your garden is a lot of fun! I just put these on request at my library! Thanks for the recommendation! I just requested this book. Thanks for the recommendation! We have Root, Shoots, Buckets, and Boots. I was hoping to get started on something in May but I think it rained every day! I'll have to see what can be done in June.